Yet another memorabilia card finds its way into the Herschel Hoard. 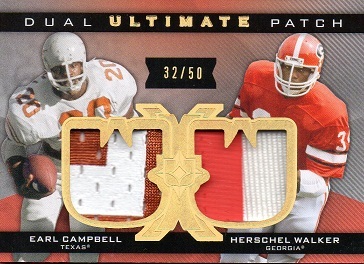 This is a 2013 Upper Deck Ultimate Dual Patch card, #UJ2-CW, and features jersey patch swatches from Earl Campbell and Herschel Walker, both in their college colors. 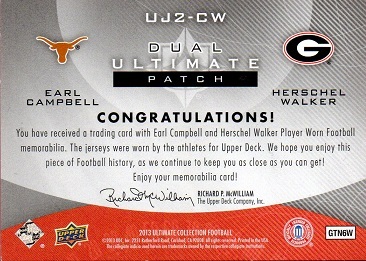 The card is a companion to the one that features Herschel and Bo Jackson, which I already have in my collection. This card is serial numbered to 50, with this example being #32.